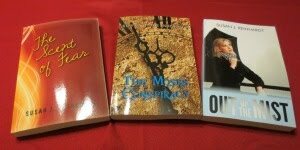 Christian Writer/Reader Connection: I Feel Another...CONTEST...coming on! Oh me! Me! I so need some sweet respite from this weary, weary world. I'd love to win. I'd love to be entered! Thank you. Sounds like a good book! I love books like this because strong characters really intrigue me. This sounds like a good book. I like Patricia's previous books. You're welcome. Thanks for entering. No same old, same old characters here. I think you'd enjoy her book. Welcome to my blog! As I said to another commenter, I post here Monday, Wednesday, and Friday. Thanks for stopping by and entering the drawing. I hope you'll visit often. My posting schedule is Monday, Wednesday, and Friday. I think you'd like this book also. Patricia Hickman paints brilliant word pictures. You're entered in the drawing. I hope you'll stop by often. You'll find a new post on Monday, Wednesday, and Friday. I love books by Patricia Hickman. She is a wonderful author who really loves the Lord and puts many wonderful things about the Lord and Christian living in her books. I love contests also. Thanks for stopping by and entering the drawing. Patricia Hickman has a way of getting under a character's skin and revealing their heart. It's one of the reasons I enjoy her writing so much. I hope you'll visit often. I'm here Monday, Wednesday, and Friday. I've met Patricia Hickman in person. She taught a class at the Philadelphia conference in 2007. She's a lovely, compassionate person, and Christ shines through her. Thanks for stopping by and entering the contest. I hope you'll visit again. My posting schedule is Monday, Wednesday, and Friday. Sounds like a gentle read. Sign me up! 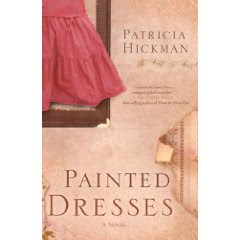 I would love to have a copy of Painted Dresses! Thanks for having this contest:) And yes, please enter me. Blessings to you and your readers! I've heard good things about this book. Thanks for stopping by and entering the drawing. Have a great evening! Welcome to my blog, and thanks for entering the drawing! You can find me here Monday, Wednesday, and Friday. Hope you'll stop in again soon. I appreciate your comment and entering the drawing. Patty's book has a lot of depth...and some tense moments. I post here Monday, Wednesday, and Friday. You're always welcome at Christian Writer/Reader Connection. Not only is Patty an excellent writer, but she's also a wonderful teacher. If you ever get a chance to attend one of her workshops, grab it! How cool! Patty's on Facebook. Maybe you connect with her there. Just wanted to let you know I stumbled on your site from Jean Fischer's site and I'm thankful I did. As a new writer with a new blog page, I'll be adding your blog as one of my links. I know it will be as much as a blessing to those who read it as it has been to me and I hope it brings a little traffic from my little corner of the world. I visited your blog and subscribed. Your most recent post beautifully presented the truth of running to Jesus when we have a problem and allowing Him to comfort us. I'll be in touch. BTW, I post here Monday, Wednesday, and Friday. oh, and I wanted to let you know about my blog address change. *sigh* If you're following me, my posts now won't show up in your feed, dashboard, sidebar, whatever. So please forgive me, but you'll have to change the address for my main writing blog, Where Romance Meets Therapy, to http://jeanniecampbell.blogspot.com. To do this, you have to "unfollow" me and follow me again. Sorry for the confusion! This sounds like a great one, Susan! Thanks for entering the drawing. I've made a note of your blog address change. I appreciate the info. I enjoyed it. :) Thanks for entering. This book sounds like just the vacation I need! Please enter my name. You have my email. Yeah for contests and the chance for a free book! Enter me in the drawing, too. Thanks so much for going to my blog and subscribing. I'm so new to this whole world of writing and I'm so thankful for the opportunity to learn from others. Thanks for subscribing to my blog. I'm pretty new at that too. But we do serve a Wonderful, Counselor and I'm so excited about this new dimension of ministry He seems to have added to my life. You're welcome. :) I've been jammed, but I plan to contact you. Talk to you soon.